Macrophage attacks Clostridium bacteria. 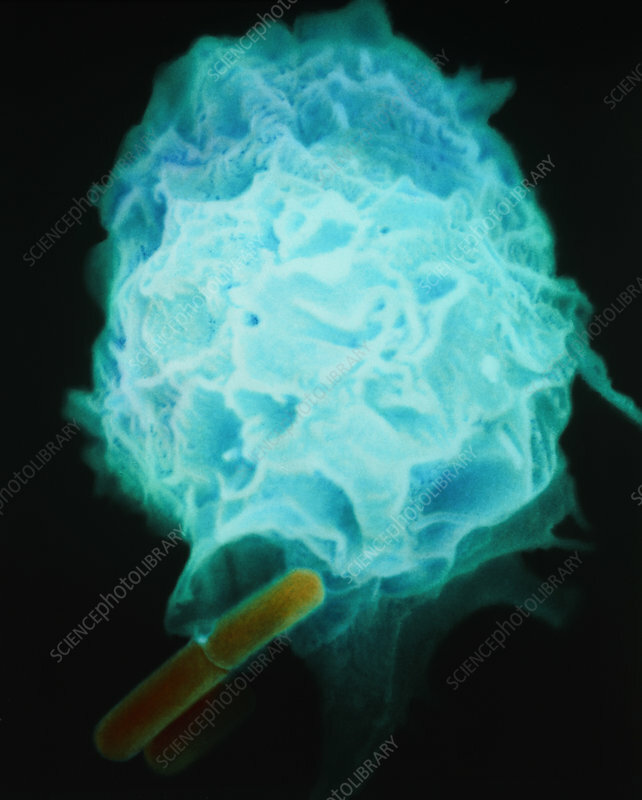 Coloured scanning electron micrograph (SEM) of a macrophage attacking Clostridium sp. bacteria. The macrophage (blue) is extending microvilli (cytoplasmic projections) towards the bacteria (rod-shaped, yellow) to engulf them. This process is known as phagocytosis. These bacteria are commonly found in wound infections and are a major cause of gas gangrene (tissue death through infection). Macrophages are part of the immune system which keeps the body free of invading organisms. Once engulfed, these bacteria will be chemically destroyed by enzymes. Magnification: x3,000 at 6x7cm size.